If your conversions are suffering due to poor design, a failing call to action, or just lacking the ability to handle daily operations, then you need to make some changes. 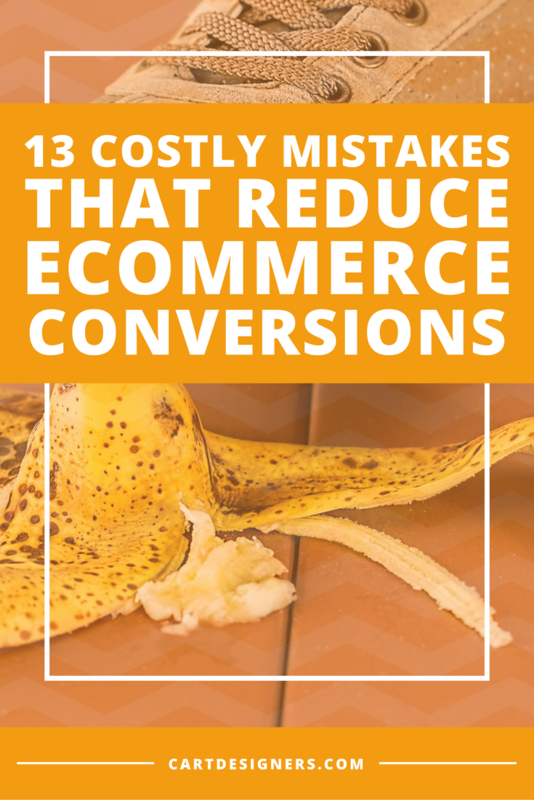 Mistakes that reduce ecommerce conversions can be avoidable, if you know what to look for. These can either be fixed or properly implemented in the beginning in order to avoid them entirely. We’ll examine several of the most important flaws to find out what you can do to increase your revenue. Difficult to Find or Invisible CTA (Call to Action): This is crucial, considering it’s where your customer goes next in order to convert. If a potential customer doesn’t know what to do next, they’ll simply leave. Worse yet, they won’t return, having chalked your business and website up to a bad experience. Have an easy to find CTA. Make it clear, but don’t oversell it. Noticeable, but not overwhelming. You get the picture. Do you convey trust? If a visitor doesn’t feel they can trust you, they’re gone. Plain and simple. While building trust takes time and effort, there are certain elements that can be on display from the start to help convince new visitors that you’re safe and reliable. Including affiliations, reviews, testimonials, and displaying badges of publications are all useful ways to convey trust. Not Including Incentives: Oftentimes, a deal is the only way to convert someone. Including offers such as “Free Shipping” or “15% off your next order” are effective ways to make a sale. Urgency for First Time Conversions: The sense of “buy it before it’s gone” has proven to work. Pitches such as a limited time offer, or “time left to download: 15 min” with a timer ticking down can be useful tools to convert a visitor. Not A/B Testing: While this is still fairly recent in the data measuring and growth driven design world, effective online stores are implementing all of these factors to the tune of immense results. Whether you’re trying different colors, fonts, or headlines, A/B testing simply tells you what gets more attention. Or what gets a better click rate. These things matter, if you haven’t already noticed. Not Enough Product Information: Your product should have all of the details about the product (some extras can be included in a drop down menu for example, for less clutter), as well as answers to any questions. If someone is left wanting to know more, they may do so, on a website that provides more insight instead of yours. Poor Product Images: Pretty pictures make a difference. Having multiple angles as well as clear and high quality photos presents your product in the best way possible. A buyer will be far more motivated to make a purchase if they can see the detail and craftsmanship of your product. Complicated Checkout Processes: The fewer steps the better. You should provide a simple and direct experience that guides the customer through the basket, delivery, and payment details. Include a confirmation page with relevant reference numbers, shipping dates and customer service contact details. Not Allowing Guest Checkout: Forcing registry for an account adds extra steps and time for the checkout process, both of which directly reduce sales and conversion rates. Let guests make purchases without taking the time to fill out a form if they don’t want to. They’ll soon find out about the benefits of doing so if they like your product and choose to come back. But more importantly, they’ll buy something. Not Clearly Showing Delivery Costs: Unexpected costs are the number one reason for cart abandonment. You should include clearly explained rates, and options to allow the customer to choose whether cost or speed is most important to them. Lack of Payment Options: Over 40% of all online transactions are made through Paypal, e-wallets, or mobile. That number is expected to be the majority by the end of 2017. The more ways someone can pay you, the more likely that they actually will. Poor Site Search: If your potential customer can’t find what they’re looking for in your search, the time it takes to manually browse your catalog increases the likelihood that they will not make a purchase. Be sure that your site search option is visible, and useful. Lacking Customer Service Options: If you aren’t offering multiple ways for customers to get help, such as phone, email, or live chat options, you will lose customers. Quick responses greatly improve the likelihood of a visitor completing a purchase. If you haven’t fixed these leaks in your website that reduce ecommerce conversions, you’re missing out on current and future customer prospects. A quality design team will make sure that features as important as these are included in your online store for maximum results. If you’re wondering about your online store design, check out 9 Ways to Know if Your Ecommerce Design is Effective and see what changes or additions you might need.